We recently recounted the beginnings of the wool blanket saga, and now for part two, the finale to the ultimate 2017 Blanket Creation story. Creating the wool blanket for the waulking at Florida Tropical Weavers Guild Conference was an exercise in flexibility. of fabric, it is best not to get too tied in to a plan. But plan we did. Afterall, we did sample to determine the best sett, and we even got a scarf out of the sampling process. However, the cone ends didn’t cooperate, and as cones ran out, other possibilities had to be explored. We finally wound two warps: one primarily blue and green with more or less a pre-planned order to the colors using royal, admiral, bottle green and emerald; and a second warp with our spice colors of deep purple, marigold, copper and cinnabar. We wound the two warps together onto the back beam, and then when we threaded the loom, we interspersed the spice colors in among the blues and greens in a more or less random fashion. Finally, after much gnashing of teeth the loom was ready to go, more weft ordered, and the weaving took off (a particularly apt expression, as you will see in a bit). It is amazing how fast weaving a blanket at 8 epi weaving can go. Two weeks of weaving, and 16 yards of fabric materialized around the cloth beam. That’s a lot of wool! The day before the conference, 16 yards of pretty wool fabric…although the wool fabric does look like burlap before it is washed and fulled…were packed into the car and headed to beautiful Lake Yale in the middle of Florida. Melissa Weaver Dunning was there teaching Tartan weaving and she would be our guide for the waulking. Melissa helped us with the final preparations once we arrived at Lake Yale. First, we sewed the beginning and end together to make a gigantic loop. We had to take extra care that we didn’t make a Mobius loop as that would twist the final fabric in ways that we didn’t even want to think about. Then, the HUGE chunk of fabric had to soak overnight. Thank goodness Lake Yale Conference Center has bathtubs in the rooms! The next afternoon, we squeezed the water out of the incredibly heavy fabric, and transported the fabric to the room by the lake where we were going to do the waulking. Thankfully, Sara James was next door and had a cart that we could use to carry the wet fabric. 16 yards of soaking wet wool weighs a lot, we couldn’t pick the whole length up at once, and images of wrestling with an anaconda kept coming into our minds. Lots of giggling accompanied the sweating as we pushed the fabric along. At last it was time to sing and turn this wet burlap loop into soft, fulled blanket fabric. Melissa explained that waulking is a traditional Scottish way of fulling wool and we would spend about 45 minutes, get sore hands and arms and end up with what can now be done in a washing machine in about 5 minutes. But, hey, this was fun! Waulking goes back to at least the 13th century, and while it was done all over Europe, Scotland was alone in having Waulking songs. The songs were designed to provide a strong beat to keep the cloth moving, were changeable and often bawdy to entertain the listeners. Melissa sang all the favorites, and entertained us while we worked at the fabric. If you would like to watch a short clip of the blanket waulking, you can see it below. We also have a longer version on our new You tube channel. Our Waulking was great fun although we had a bit of a distraction part way through. Remember, it is all about flexibility! About 15 minutes in, someone looked at her phone and announced that a satellite would launch from Cape Canaveral in the next few minutes and would likely be visible over the lake. Squirrel!! We jumped up from our re-creation of an age old tradition to see the latest technology take flight. After marveling at the juxtaposition of the technology age and the ancient traditions of preparing fabric, we returned to our task. Another half hour or so later, the fabric that began as coarse as window screen became full, dense, and very soft. 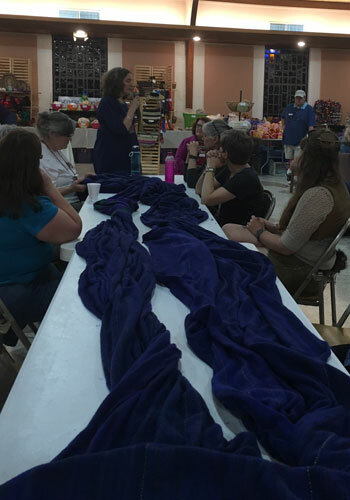 During the process, the fabric went from 59” wide to 44”. This very special cloth is now cut into 2 lengths, one for Michele in Florida and one for Katzy in Idaho, ready to become very special blankets to keep us warm on those chilly winter nights. We will post pictures once the blankets are sewn together and ready for snuggling! By the way, FTWG is a great conference and a great way for our northern friends to escape winter for a few days if you are looking for somewhere warm to be in early March each year. Hey there!, I found this information on Lunatic Fringe Yarns for you: "Waulk On…Waulking a Blanket Part 2". Here is the website link: https://lunaticfringeyarns.com/waulk-waulking-blanket-part-2/. Thank you.